Why did my attack fail on Beast or Red Guard? Why can’t I use teleport? Which Resource Collector should I Build First? What is the Hall of Heroes for? Where Do I Get Gemstones? Where is the Creation Arena at? What is the Airship for? Do You Need to Build Hospitals? If you are into MMORTS (massively multiplayer online real-time strategy) kind of games like Clash of Clans, then Guns of Glory is probably a good alternative to play which is pretty much just as polished, and have a great population of players to boot. The game follows the Story of the "Three Musketeers", a historical and adventure novel inspired by the french revolution, which sets up the "conflict" in the game as you play "the banished legion" called out for uprising against the kingdom, upon meddling with the various injustices, abuses, and absurdities of the old regime controlled by the Cardinal. And though the motif and era for which the game iS designed with may not exactly cater to everyone's preference, it is surely not that hard for anyone get a liking to this game. For the most part, it shares the same basic foundations as that of the usual MMORTS games flooding the mobile platform. Ultimately, you may see it as a unique variation of an RTS game, skinned specifically to accommodate the accompanying lore - which itself is not bad at all. 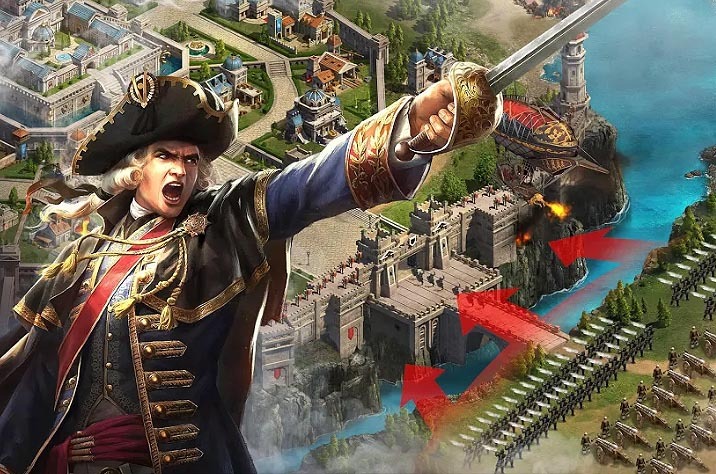 If you are not familiar with thiS types of games, the basic gist of the game is to have you lead a new and rising capital, and perform everything in your power to advance in terms of building the variety of facilities in your base, upgrading them, researching and developing warfare machines, joining alliances, or even by training soldiers to fight your battles. Given the motif, the cardinal's personal army would ultimately be the default adversary in the Battlefield. In the game, you are also tasked to put up effective defenses for your capital in order to protect it from the multitude of players that can plunder your Resources. With all these variables in place, it is entirely up to you how to strategize in order to become effectively powerful in the game. One more thing that would most likely make you consider playing the game is its popularity. Given that it has 10 million downloads from google play alone makes it a very well populated game - meaning you'll never run out of co-players to play the game with.